NO2 OVERLOAD is the ultimate pre-workout drink. We fully believe that this formula is currently the best pre-workout supplement on the market. This is based using research and customer research. The new formula has had DMAA removed due to it becoming banned in the UK, however we feel the new formula is just as good, if not even better. NO2 OVERLOAD gives you pumps like you've never known before. 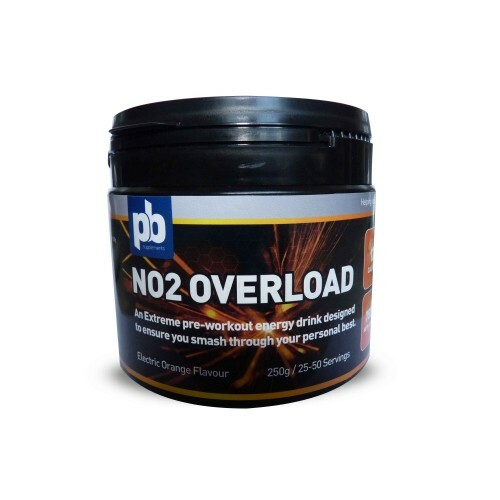 When using NO2 OVERLOAD you'll find youself with explosive energy, strength and power throughout your workout. This product will give you strength and energy you never knew you had so be sure not to miss out on being able to hit new Personal Bests. Directions of use: Take 10-15g (10g scoop included) with 200ml of water depending on desired taste. Drink 30 minutes before exercise. One mixed consume within 30 minutes. DISCLAIMER: This product no longer contains a UK banned substance called 1-3 dimmathylamylamine, commonly known as DMAA.